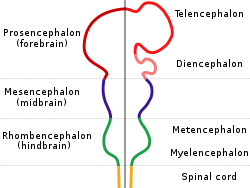 Diagram depicting the main subdivisions of the embryonic vertebrate brain. These regions will later differentiate into forebrain, midbrain and hindbrain structures. Scheme of roof of fourth ventricle. The rhombencephalon (or hindbrain) is a name for parts of the central nervous system in vertebrates. Chick embryo of thirty-three hours’ incubation, viewed from the dorsal aspect. X 30. Embryo between eighteen and twenty-one days. This page was last changed on 28 June 2018, at 12:44.